Arrr! 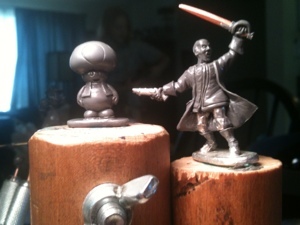 Here be a quick peek at my current sculpting projects. First up be a commission from me son. Some scurvy wretch of a lubber called Toad or some such. 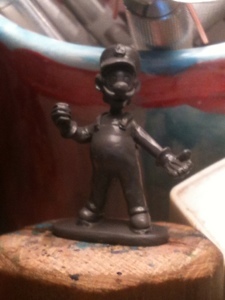 He hails from the crew of Mario and Luigi. They be some sort o’ famous pirates I heard tales of but never yet met meself. Real gentlemen o’ fortune by the tales. Second in the pix be a navy man. A hero type bloke from the royal marines that be rumored to be sailing fer these waters. It’s a bit of a distraction from my regular piratey fare, but this is Luigi (Mario is still a WIP). My kids love Mario and Luigi so I’m working on their 28mm versions.